From now on, with all ALMA data delivery that you receive, you have the possibility to request its calibrated measurement set (MS). 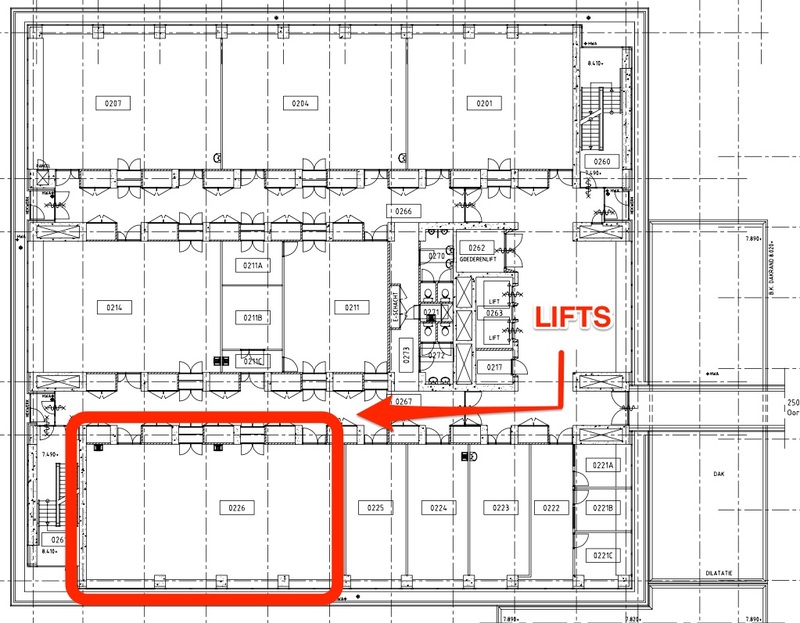 This has to be done within a week of the data delivery date via the ALMA HelpDesk. 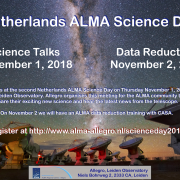 For those interested, ALMA data reduction training with CASA will be offered on Friday November 2 by Allegro, the European ALMA Regional Center node in the Netherlands, at Leiden Observatory. 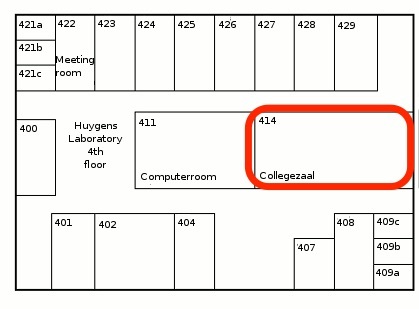 Note these specify the route to the Lorentz Center, which is in the forward leaning building in the photo.The event will be held in the joining taller building – The Huygens building. 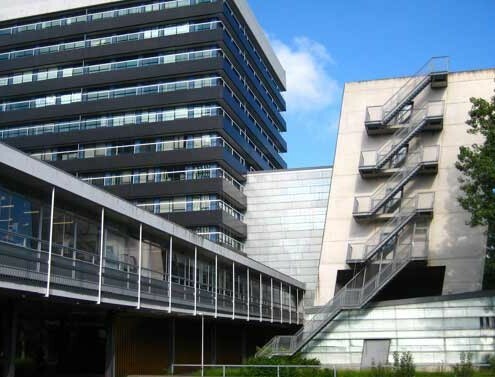 Leiden Observatory and Allegro offices are located on the 4-5th and 11th floor of that same building, respectively. 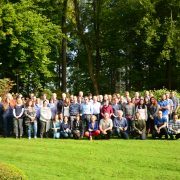 The second Netherlands ALMA Science Day will take place on Thursday November 1, 2018, at Leiden Observatory. 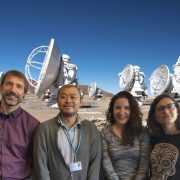 Allegro, organizes this meeting for the Netherlands ALMA community to share their exciting new science, hear the latest news from the telescope, and discuss user experiences and ALMA-related topics. Sign up to share a day with the top ALMA science done in our region. Contributed talks (~20 min) are welcome: If you are interested in presenting your recent results from ALMA, please indicate so in the registration page. For those interested, the meeting will be followed by an ALMA data reduction training with CASA on Friday November 2 at Allegro. Sera Markoff and Remo Tilanus at Astronomy on Tap! 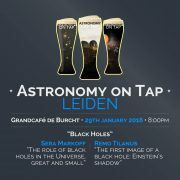 In the first event of the year of Astronomy on Tap in Leiden, Sera Markoff and Remo Tilanus will tell us about black holes and how they help us understand the Universe. Sera Markoff is a professor at the Anton Pannekoek Institute for Astronomy at University of Amsterdam. She works at the interface of Astrophysics and Astroparticle Physics, and is interested in a variety of problems relating to the accretion process especially around black holes, both big and small. Astronomy on Tap features scientists and educators who speak of their passion for astronomy and research. Professional astronomers from the Leiden area hold informal presentations on a wide range of astronomical topics, every last Monday of the month at Grand Cafe De Burcht. More information at astronomyontap.nl, Facebook page of Astronomy on Tap Leiden, Twitter: @AoTLeiden and #AoTLeiden – Instagram: aotleiden. http://www.alma-allegro.nl/wp-content/uploads/2018/01/aot_black_holes.jpg 2000 2000 Allegro http://www.alma-allegro.nl/wp-content/uploads/2016/01/alma-allegro-750-1-300x99.jpg Allegro2018-01-29 12:21:122018-01-30 16:08:02Sera Markoff and Remo Tilanus at Astronomy on Tap! 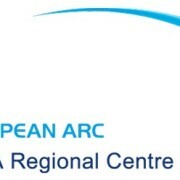 Contributions from Allegro team are highlighted in the new edition of the European ARC Newsletter. You can find a summary on the critical work done by a team of Allegro members and JAO staff in the Cone Searches for High-Frequency and Long-Baselines projects, as well as a contribution related to the WVR Scaling Module. 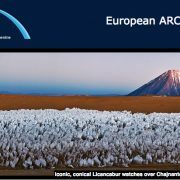 The December 2017 European ARC Newsletter edition is available at this link. Your local ARC node members will run in the Leiden Science Run 2017. The race aims to gather donations for the Foundation for Refugee Students (UAF). The foundation provides advice for refugee students on their studies and integrating into the European education and jobs system(s). Further information regarding the foundation can be found at the official UAF website. Our team is called ‘MeAllegro’ with the motto ‘coherently challenged’. Please donate to support us using any of the following forms: donation1 or donation2. 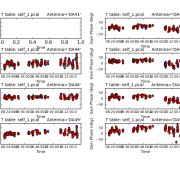 By supporting our team you are also encouraging us to achieve better coherence over the ALMA long baselines data! Donation forms: donation1 or donation2. This yearly meeting brings together all the expertise in the network, in an unique occasion that allows us to share our experiences, strengthen our links and discuss pass, present and future developments. We all are looking forward our next meeting organized by our colleagues at the Czech ARC node.